HSBC's advert with a pretty little girl behind a lemonade stand is so charming. Talk about pushy Moms (why are we always the bad guys? ), but it is her Dad who makes her lemonade. It is so sweet that she is so business savvy. It is so sweet that she is multi-lingual at a very young age, such a good foundation for a future business mogul. It is fascinating that though the street is an ordinary residential area, it is the on the tour bus route. It is so clever that none of the neighbours have noticed the business opportunity except this cute little girl. There is a Philippine version of this scene. At the front of the house sits a simple table with big jars of different flavoured coolers: buco (young coconut) juice, gulaman at sago (agar agar and sago drink) and melon drink. Kids man the stall. A compulsory implement is a fly shooer: wisps of plastic strips tied to the end of a stick with rubber band. Whatever you do, do it with your right hand. Your left hand should constantly be waving this sparse cheerleader's-pom-pom-on-a-stick to shoo away the flies that are most attracted to your drinks than anyone else. No one is put off. On a hot day, the sight of a jars of iced drinks dripping with condensation are most welcome. Brain freeze is a joyful relief to aching thirst. 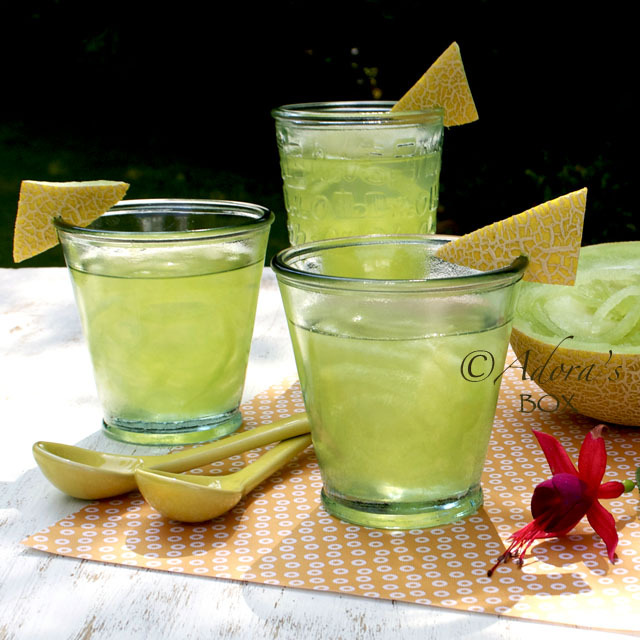 The simplest one to make is the melon drink, which I dub the "melonade". The melon flesh is scraped with a special tool, the seeds mashed in water then strained. 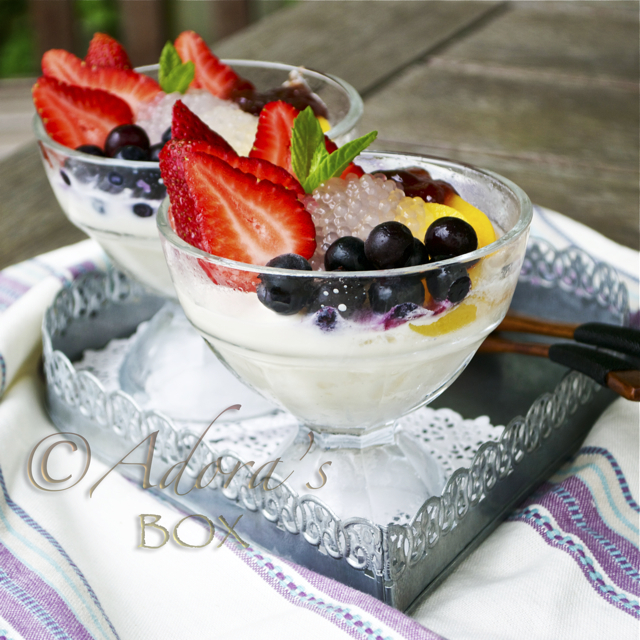 After mixing with water, sugar and ice, a delicious, cooling drink is ready for you to enjoy. 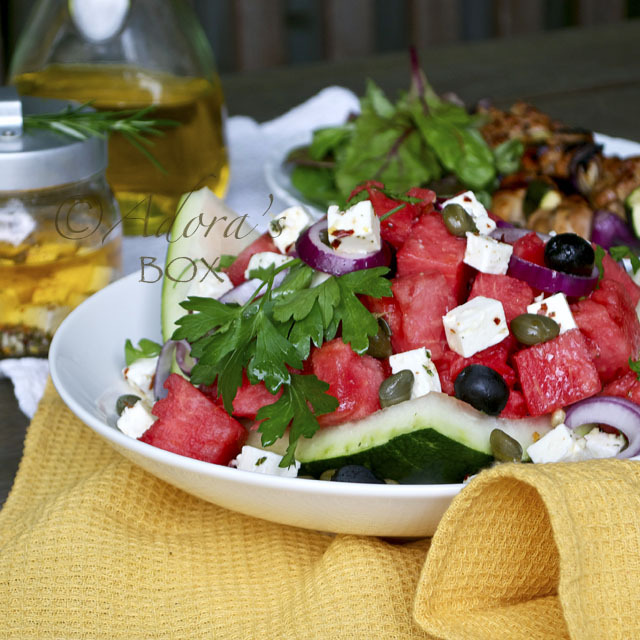 The strings of melon are eaten with a spoon. 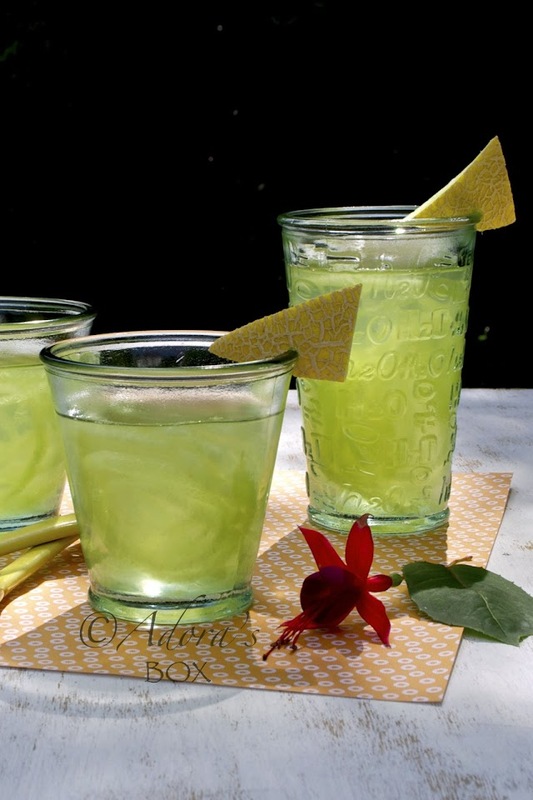 Although this drink is usually made with cantaloupe melon, I made mine with galia. I find galia sweeter and more refreshing in taste. I made my melonade with less strings because I want the melon flavour in the drink to stand out. I pureed most of the flesh before adding the whole strings of melon that I've set aside. In this form, a jumbo straw can be used for sipping both the drink and the melon bits. You can substitute crushed ice for part of the water to make melon slushy instead. Scoop out the seeds from the melon and mash with 1 c. of the water. Strain. I use a special scraper to make strings of melon. A coarse grater would also do the job. Make about 1 c. of melon strings and set aside. Scoop out the rest of the melon flesh and top up with the juice from the seeds and water to make 2 litters. Add the sugar and blend with a hand blender until smooth. You may need more sugar than this if the melon is not sweet enough. Add the melon strings. Serve with ice and enjoy. Wow! This melonade looks so refreshing. I can't stop staring at the pretty pics of those tall glasses! Yummy! Thanks for sharing & thanks for the wonderful blog-visits! 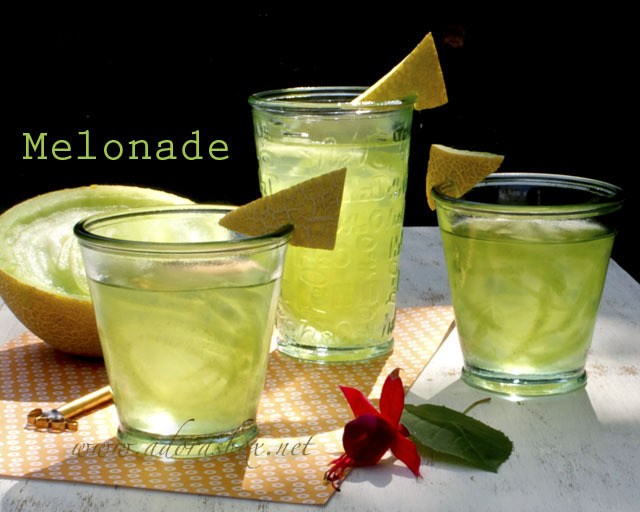 Your melonade (very creative)looks very refreshing. I've never seen galia before and I don't think we even have it here. Well, I guess cantaloupe will do. Thank you, Adora. I have enjoyed watching the commercial! 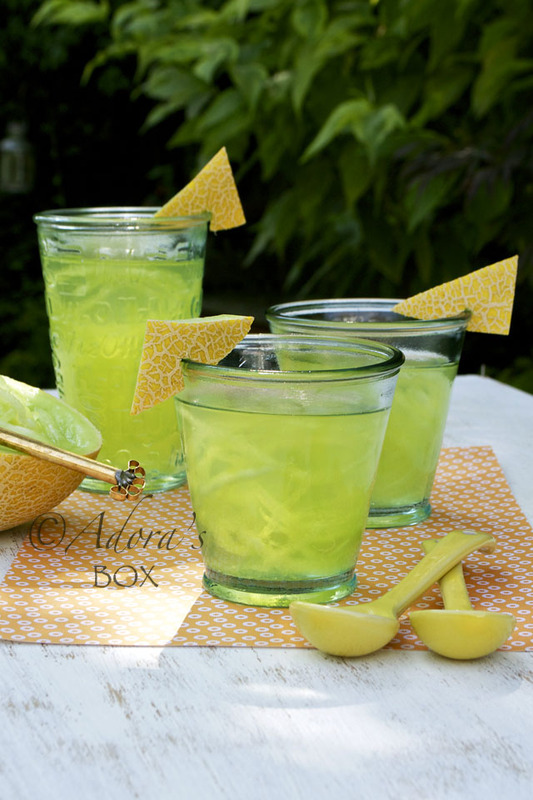 Whether its Lemonade or Melonade, it is a refreshing drink for summer, right? Oh, I like that little "gadget" thing that you grate the melon slice out. Cool. What a creative drink, this sounds just awesome! What a beautiful drink! I love the strings floating in it and the color! Fabulous photos! In reference to the lemonade stand, I live across the street from a small neighborhood park and each summer at least one or two of the young girls in the neighborhood set up a lemonade stand on the weekend. They are quite successful. I didnt know those were called Galia melons, your tips are going to come handy for sure one of these days. Hey that add is super cute! I wish I could have sold lemonade like that when I was small. I dont think so u can do that in europe like that, u need a liscenes for anything and the rules are much stricter. Thats why me and my husband had started a restaurant here in india. This counrty might be chaotic but at least they allow u to do things here. Thank you for the refreshign post! Just found your website and Wow love all your recipes I will have to try some of them.